New Hampshire-based New Energy Capital (NEC) recently completed an upgrading of the company's biomass-fired power generation facility (left, inset photo) in Greenville, Maine. In an interesting twist, Maine's biomass-fired power generators actually benefit more from the legislation from states further south, rather than the legislation in their home state. One new 500-megawatt (MW) power plant will need to be commissioned every year for the next 10 years in the northeastern United States if the growing consumption demand in that region is going to be met. That bodes well for renewable power generators, particularly in places like the state of Maine, which currently has a surplus of power being generated from renewable fuel sources like biomass. Strong competition is expected for this growing energy market from both traditional energy producers and power producers using renewable energy sources. What's helping the renewable energy sector, particularly in states such as Massachusetts, Connecticut, Rhode Island, and Maine, is legislation from state governments mandating that all electricity marketers must include a portion of their supply from renewable energy. This is called the state's Renewable Portfolio Standard (RPS) and Maine has the highest RPS in the United States, requiring that at least 30 percent of power sold in the state comes from renewable energy or efficient generation. Also, earlier this year, the State Legislature set a goal of increasing the amount of renewable power generation in Maine by a further 10 percent over the next decade. While the state's benchmark is the highest, it does not necessarily reflect an aggressive commitment to developing renewable energy. It more accurately reflects how power has traditionally been generated in the state, which at present gets well over 40 percent of its power from sources like biomass and hydro. That's because the state has the largest forest products manufacturing sector in the northeast and an abundance of rivers. Companies like Boralex Inc. have made a substantial investment in biomass-fired power generation in the American northeast. The company is now the largest producer of wood-residue energy in North America. It has five thermal power stations in Maine and New York and a total installed capacity of 186 MWs. Its operations consume nearly 1.6 million tons of wood residues per year. "There is a very important relationship between the forest products community and the biomass industry in the state of Maine," says Dave Wilby, executive director of the Independent Energy Producers of Maine. 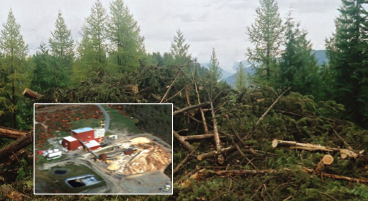 In fact, the forest industry was close to a full blown panic about six years ago when some biomass-fired power generating plants were in danger of closing down, fearing that this would result in a massive surplus of wood residuals. By the same token, the downsizing of the North American pulp and paper industry is currently making biomass-fired power generators equally nervous, as they worry about possible disruptions of supply. The $12 million upgrade at NEC's 16 MW facility will improve its performance and increase its generating capacity. Construction workers install a refurbished turbine rotor, and a new ash conveyor is wired (below). The maturity of Maine's biomass-fired power generation industry is greatly envied by more populated states with fewer renewable energy resources. Maine benefits greatly from its location and regional power linkages. It is the state's close proximity to more populated states, its participation in the Northeast Energy Pool (which distributes power equitably among six New England states), and the RPS systems of more populated states further south that are keeping Maine's biomass-fired power generation industry viable. "Frankly, when Maine put the 30 percent RPS in the Restructuring Act in 1997, the point was preservation more than development of new resources," says Wilby. "The Maine RPS is really more symbolic than having any practical effect." Biomass-fired power producers, like the New Energy Capital (NEC) power plant in Greenville, Maine, would like the state to raise its RPS even further. "What needs to happen in Maine is that the portfolio requirement needs to be increased," says NEC chief executive officer, Scott Brown. "It's really irrelevant now, since the hydroelectric capacity alone exceeded the requirement at inception. Most states don't include hydroelectric in their definition, or if they do, they set the requirement high enough above existing capacity to provide an incentive for new renewable sources. The Maine requirement has no impact as an incentive for new generators." While little political appetite has been shown for increasing the RPS in Maine, Wilby says a number of initiatives have been discussed to boost the RPS value. One is to place more limits on the types and sizes of renewable power facilities that would be eligible under the RPS program. A second idea is to reduce the size of power plants using hydro that would be eligible. At present, plants producing up to 100 MWs are eligible. A third suggestion is to change the eligibility rules for renewable power producers importing power into Maine, making it more difficult for them to meet RPS qualifications. "With a combination of these suggestions, you might get the supply/demand ratio back in line to the point where the Maine RPS would actually have a value," says Wilby. However, the Independent Energy Producers' group would have a difficult time making a case for these initiatives at the present time, he says, because higher energy prices are having a positive impact on their bottom lines, after suffering through rather lean times between 1999 and 2003. Maine restructured its power industry in 1997, evolving from a vertically integrated utility system to a system where power generation has been decoupled from power transmission and distribution, creating more competition for retail business. Other New England states--as well as California--took similar action. Under the RPS programs in Maine, Massachusetts, and Connecticut, each kilowatt of power generated by a certified renewable energy producer results in a renewable energy certificate (REC), which has a value depending on the market demand for that certificate from energy marketers. According to Wilby, RECs in Maine have virtually no value because of the surplus of renewable energy being generated in the state. However, a REC in neighboring Massachusetts is worth about $50 because the supply/demand pendulum is much more in balance in that state. Being part of a regional power distribution pool that includes six New England states is where Maine's renewable power generators stand to profit the most, as the further south one travels, the greater the number of power consumers and the greater the energy demand. "Whether you are making electricity in Massachusetts or Maine, you are essentially selling into the same market," says Wilby. He adds that because RECs in neighboring states have greater value, this has fuelled some investment in renewable energy production in Maine. "There are a handful of plants in Maine that have either restarted or in some cases, retooled, to make themselves eligible for the RECs in other states." One example of a recent investment in upgrading is the biomass-fired power generation facility in Greenville. New Hampshire-based NEC recently purchased the 16 MW facility from Hafslunde ASA of Norway. NEC completed a $12 million upgrade at the facility earlier this year to improve performance, increase generating capacity, and reduce emissions. The Greenville Steam Company power plant has been in operation since 1985 and directly employs 24 people. The refurbishment and upgrade created approximately 30 jobs during construction and will ensure the continued operation of the facility. New combustion and emission controls technology were supplied by Energy Products of Idaho Inc., and Mobotec USA Inc., of Walnut Creek, California. "We think the market for electricity in the northeast is going to remain strong," says Brown, "and we think policies in the northeast for renewable electricity will remain very positive for the industry. The RPS system is critical to our business. Without those attributes, biomass power would not be competitive." The company's decision to invest in the Greenville facility meshes with its strategy to invest in dominant renewable power projects in specific areas of the country. Biomass is the predominant resource in the northeast. NEC is heavily invested in renewable energy assets producing or using ethanol, biomass and biodiesel as well as power that is produced on site and close to end users. "We think the outlook for all renewable energy production is very bright, largely because of growing concern over climate change and greenhouse gas emissions," says Brown. "Electricity production that is carbon neutral will become very attractive, and we think a more valuable resource, as those concerns are reflected in policies and regulations." NEC predicts that investments in renewable energy assets and on site power will grow by more than 20 percent per year over the next 10 years, as they benefit from competitive technologies, favorable energy policy trends and the overall transformation in the energy industry. After the refurbishment and upgrading of the Greenville facility to 17 MWs, the plant is expected to qualify as a New Renewable Generating Unit under Massachusetts regulations, making it eligible to sell RECs to energy marketers, and according to the company, "establishing Greenville as an important source of renewable energy for the New England market." While establishing renewable energy portfolio standards has had a positive impact on the biomass-fired power generation sector, meeting the qualification standard of each state is challenging. For example, Massachusetts demands that renewable power plants achieve a certain technology standard before they can qualify under its RPS program, while Connecticut requires that renewable power plants must meet certain emission standards. "So you might have a renewable power generator in Maine that is eligible for Connecticut but not for Massachusetts," says Wilby. While growing demand for power in the northeast is good news for biomass-fired power generators in Maine, there is concern about the limited capacity of the existing power transmission infrastructure and who is responsible for building and paying for additional transmission capacity. "Our current transmission infrastructure is oversubscribed at key hours on key days," says Wilby. "So we are constrained to a degree. To this point, it has not slowed development too much, but it will from this point forward."